THE BIG NEWS this month is the release of Klingon Armada, an expansion for the well-known Starmada game. (We also released a print version of the Starmada Admiralty Core Rulebook). This is an important new release because it gives Star Fleet Universe players another game system and it brings the many Starmada players into the Star Fleet Universe. Have you ever looked down at your ship and your pile of energy at the start of a turn, and thought "Man, I would like to repair a couple shield boxes, but darn is that expensive, and I need the power for so many other things"? If you are one of those who like to end a turn with full batteries, you might sometimes pass up an opportunity to reinforce, to save power. When you have engaged your enemy, give careful thought to whether you might be tempted to repair shield boxes next turn. If so, you might want to go ahead and reinforce for two or four points. You have either preserved twice the shield boxes, or saved half the power, compared to what you would have done next turn. And your power situation next turn will be no worse than if you had repaired shields. You might even have a couple extra points to play with. When fighting plasma races in fleet battles, do not forget to arm probes in information-gathering mode (one for each of the probe launchers in your fleet). You know, that little box on your SSDs that you usually forget about? No, you do not have to be crippled to use a probe in information mode. It is one point of power over two turns, and you have limited ammunition, but it is power and ammunition well spent. A probe in information mode has a 360° launching arc, can be launched at a plasma torpedo up to six hexes away, and will automatically determine the target of that plasma torpedo. This six-hex distance is important, because at this distance (assuming your ships are moving speed sixteen or faster) you can still decide to turn away from the inbound plasma torpedoes to outrun them, or to reduce their warhead strengths with phasers. In fleet battles, the plasma player is likely to have concentrated his torpedoes on a few of your ships. Once you know which ships are the targets, you can decide to have these few ships turn to outrun the plasma torpedoes. 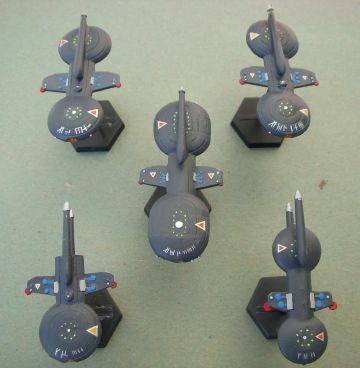 In the meantime, the remainder of your fleet presses on to obtain closer range to the enemy fleet. At closer range, fewer ships can likely cause more damage than your opponent's entire fleet at longer range. If your opponent has spread out his plasma torpedoes more evenly over the ships of your fleet, you will still be in a better position to decide whether to turn the entire fleet off, or to accept less damage on all of your ships and press on. 1) Place a CA at 0408 in your opening setup, then convert it to a DNL. Have this DNL carry your Marine Major General plus a Prime Team to hex 0803. 2) Convert your JagdPanther to the G version on Turn #1 along with two CAs to CCs in hex 0608. When you come around to resolving the battle in hex 0803 the Marine Major General will let you add +7 ComPot from the JGP each round as an extra ship. By bringing the Prime Team along you will also add another +2 ComPot along with +2 more from the two newly converted CCs. A total bonus of +11 ComPot will come in handy in a difficult battle for a hotly contested hex 0803. It is also sweet using the 11 ComPot DNL in the battle as well. The Kzintis cannot counter this tactic of adding an extra ship (JGP) as they have neither a Marine Major General nor a command point during the first half of Turn #1. Communique #46 has been posted to the Commander's Circle. "Sir, some good news," the Security Commander announced. "Major Kenyil reports that the boom is clear of raiders. Five of them were caught in an ambush in the Emergency Bridge and killed, another was killed in the wardroom." "Good!" Valgan said. "See? We can win this! We are winning this! Everyone else just needs to do their part." "Tell Kenyil to reform his squads," the Executive Officer said to the Security Commander, "and take everyone, bridge crew, Emergency Bridge crew, security troops, that idiot supply clerk, anyone else he can round up, and move to the rear hull, and hunt down the raiders. He has ten minutes to kill them all." "Steady on, Kurs," Rakarra said, placing his hand on the ESS man's shoulder. "You're pulling the trigger but your pistol is discharged. Reload both of your weapons. We will need them." Kurs turned to thank the Slirdarian Marine, and saw him pulling the limp bodies of Pirish and Wanekla into the barracks compartment they originally arrived in. A disruptor bolt missed him by centimeters, and Kurs jumped backwards around the corner. Someone from the destroyed engine room hatch was firing wildly down the corridor which Kurs and the team had used for their attack only moments earlier. "Come on, Lieutenant," Rakarra said, pulling him into the barracks compartment and closing the hatch. "We're moving." Kurs saw that most of Team Three was also in the barracks, and was moving toward the shower room. Two marines were lowering the wounded bodies of a comrade down the vertical access shaft that Wanekla had used to reach the fuel tanks. Someone began pounding on the inboard hatch to the compartment, and moments later, someone else was pounding on the hatch by the phaser compartment. "Did we slow the ship?" Kurs asked. "Yes," Rakarra said. "Can't you feel it?" Kurs shrugged. "I am surprised we have not been contacted by the ESS agents on board," Kurs said. "I left word for them in the computers." "I am not," Rakarra said. "Doubtless at least one was still at liberty as someone dropped the shields for us, but whoever did so was no doubt killed. The other agents may or may not be alive, or at liberty. They may have even joined Valgan. No matter." Kurs and Rakarra waited in the barracks, their weapons trained on the doors, while the rest of Teams One and Three dropped into the restroom of the barracks on Deck Six. Christopher Alper asks: A Tournament Romulan Firehawk uses its two labs to identify Kzinti drones. Later in the turn, the Kzinti smacks the Romulan Firehawk hard, and kills both the labs. Can Romulan Firehawk use a control space on that same turn to lab another drone (i.e., use three lab functions in one turn)? ANSWER: Rule (G4.32) states that the control space takes on the lab function at the end of the turn on which the last lab is destroyed, so no, he cannot do that. T. Boelter asks: A ship uses all of its lab boxes to identify drones. Can the ship use (G4.1) to study an asteroid at the end of that turn? ANSWER: Rule (G4.21) only allows drone identification if the lab is being used for no other purpose, so, no. Question: How does the Romulan fleet convert an HDW to the (525.23Q)-AO survey mission without an off-map starbase? Can it do so with on off-map HDW without one? Or does it use the 5318 starbase as the off-map starbase? Answer: By the reading of (525.23Q), the Romulans have no way to convert an HDW to do this mission, as this conversion must be done off-map, and they have no off-map bases and rule (506.3) prohibits them from building off-map bases. Given the situation, the Romulans can use the starbase at 5318 for any activities which require an off-map base, such as (542.27). Question: Can the Romulans build off-map colony bases as well as off-map colonies? Answer: There is no prohibition on the Romulans building off-map colonies in rule (446.15). However, as a practical matter, it's going to take a long time for the Romulans to build five provinces off-map (enough for one colony). Given the amount of on-map territory they have, it is doubtful they'd ever need or want to. Question: Since there are no Off-Map Area Romulan bases, can the Romulans actually reach and return from their Off-Map Area via Strategic Movement? Answer: The Romulan survey ships enter the Off-Map Area (and return from it) by Operational Movement. They have no bases in the Off-Map Area, nor may they build any; see rule (506.3). They could set up a tug off-map to act as a supply point (and SMN) or deploy a mobile base, which is not prohibited by (506.3), or build a colony there. Otherwise, it takes them two turns to transit from the capital to the Off-Map Area and vice versa. Question: By the time of the Winds of Fire scenario, shouldn't Neutral Zone hexes 5919, 6018, 6019, 6118, and 6119 adjacent to the off-map area have all been annexed as Romulan territory per (448.21)-PO? Answer: Historically, the Romulans did not do so. You may do so during the scenario, of course. 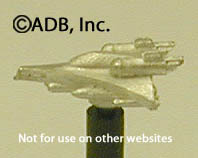 The new minis for this month are the 8 fighter miniatures which include the Tholian Spider, Federation F-18, Hydran Stinger, Klingon Z-Y, Romulan Gladiator D, Romulan Gladiator F, Kzinti TAAS, and the Shuttlecraft. More info and pictures about them can be located here.